On this page we are going to look at some of the most common types of binary options. It is important to remember that a binary options signal can belong to more than one of these groups. 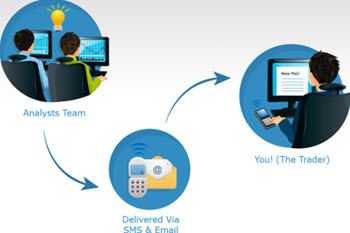 A simple signal can also be sent out through text messages and therefore also be an SMS signal. A complex signal might offer a video feed and therefor also be a live feed signal. You should therefor look at the different types that we list below as a list of definitions. Not as a definitive classification of different types of binary option signals. Simple and complex signals serve two different purposes. The simple signal is a good choice if you want to be told exactly what trades to do. Complex signals is a good choice if you want to get predictions on future market movements that you can can trade on however you want. Simple binary signals will tell you exactly what to do. You do not need to know anything at all to be able to use this signals. It is even possible to use a binary options robot to completely automate the trade so that you do not have to do anything except keeping an eye on your account statement. 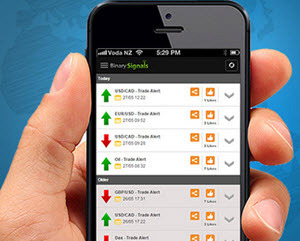 A binary option is usually sent by a text message, push notification or other from of instant communication. The signal will usually only contain brief information on the trade. The signal will contain information on whether it is a call or a put option, the market rate for the option (IE USD/EUR 1.137 ) and the time of maturity. Some signal providers will also tell you return of the binary option. This return will be true at their recommended broker but might not be true if you use another broker. If you use another broker than the return might be higher or lower than the one specified by the signal provider. It is important to act on these alerts quickly before market conditions change or time of maturity changes. You are then free to find a binary option (or several) that you can buy to benefit from having received this information. This type of signals give you the opportunity to buy more exotic options. This allows you to earn more money. They do however require that you know how to find suitable binary options to trade in with the information you receive. Live feed signals are signals that give you access to a live feed where you can watch the traders and analysts do the work. You can follow their work in detail and can see exactly what they do to find the trading opportunities that they later send to you as signals. This type of signals are often more expensive than other signals. This is due to the fact that they provide you with both signals and a way to learn how to become a better trader faster. You can learn a lot by watching these signals for an hour or two every day. Live feed signals can provide both simple or complex signals. Aggregated signals are signals provided by a service provider that has a partnership with a number of other signal providers. They aggregate these signals into their own feed. The provider curated the signals before they are sent to you. They do this to make sure to only send you the best signals. Exactly how they curate the signals can vary between different services. Some only send you a signal if several of their providers recommend the same signal. Others manual inspect the signals to see if they agree with the original signal providers assessment. Signals for automated trading are signals that are designed to use to automate your trade through the use of a binary options robot. Automated trading signals completely automated the trade and you do not have to do anything. Using automated trading signals can be a good hands free way to make money. This is true provided that the signal quality is high. We recommend that you login to your account every day to see how the trades are going. We also recommend that you are ready to suspend the automated trading at any time if the signals success rate starts dropping. One other things to keep in mind if you decide to use this type of signals is that you are going to have to give a third party access to your account. This is a potential security risk. Especially if you have a lot of money in your account. Automated trading signals should never be confused with automated signals. 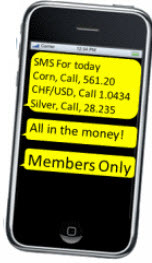 SMS signals are binary options signals that are sent to you as a text message on your phone. It is a very convenient why to get your signals wherever you are whenever they are sent out. SMS signals makes it very easy to act quickly when a signal arrives. Copy trade signals are signals that are designed to let you copy the trades of another successful trader. It is often possible to automate your trade using copy trade signals. If you choose to automate your trades then you will automatically do exactly the same trades as the trader you copying. This can be an easy way to make money if you know a skilled trader who’s skill you trust enough to copy. Etoro is one example of a binary options broker that allows you to copy another traders trades. If you do not want to trade automatically you can instead choose to get signals every time the trader of your choice perform a trade. You can then decide to copy it if you want or not to copy if you don’t want to copy the trader in this situation. These signals are produced by software that analyze the market and send out alert when certain criteria is met. Automated signal services seldom hold the same quality as human moderated signals. The quality is constantly improving as better and better market predicting software is developed. These signals are not worth price at the moment and very few automated signals are available on the market at any given time. Automated signals should never be confused with automated trading signals.